Oceanfront Voyager Boardrooms feature sweeping views of Waikiki Beach. 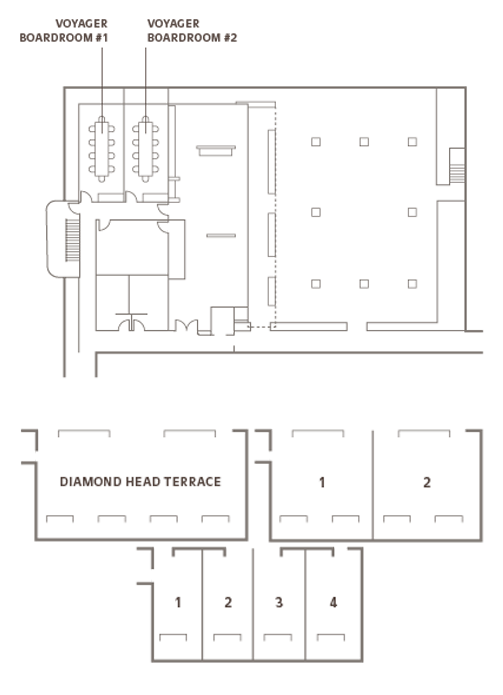 Diamond Head Terrace provides 2,520 square feet of flexible meeting space. Oceanfront meeting rooms and Voyager 47 Club Lounge VIP experience at Waikiki Beach. Outrigger Reef Waikiki Beach Resort's beachfront setting was once a favorite gathering place for Hawaiian royalty. Today, that spirit of hospitality is still embraced at this prime location for Waikiki meetings. Experience sweeping ocean views from the Hawai'iloa and Voyager Boardrooms and a VIP experience with Voyager 47 Club guest rooms. The resort's Diamond Head Terrace conference room is an alternate venue for mid-sized business meetings in Waikiki with 2,520 square feet of flexible space adjoining the swimming pool & Beach Bar. Built-in drop-down wall screens, Wi-Fi, and on-site catering provide essential services. Your attendees can enjoy the music of Hawaii's slack-key legends every night at Kani Ka Pila Grille, and dine on Pacific Rim cuisine at The Reef Bar & Market Grill. Outrigger Reef's desirable location at Waikiki Beach Walk® is near specialty shopping, and notable restaurants that include Roy's Waikiki and Ruth's Chris Steakhouse. Kalakaua Avenue's luxury retailers and evening entertainment are just a few minutes stroll. Outrigger Reef Waikiki Beach Resort is 1 mile from the Hawaii Convention Center, 3.5 miles from downtown Honolulu, and 9 miles from Honolulu International Airport. A final guaranteed guest count is due by 12:00 noon seven (7) days prior to the function. You will be charged this guaranteed count, or the actual attendance, whichever is greater. If you do not provide a guaranteed count, the "number agreed", as indicated on the Banquet Event Order, will be the final guarantee. The Hotel reserves the right to relocate a function location and back-up space based on final guarantees and set-up specifications to better service your guests. Fee: Percentage anticipated Food and Beverage Revenue plus 4.712% tax. No food or beverage of any kind will be permitted to be brought into the Hotel by the Guest or any of the Guest's agents, employees, guests, licensees or invitees without the express special permission of the Hotel. The Hotel reserves the right to charge for the service of such food and beverage. The sale and service of alcoholic beverages is regulated by the County of Honolulu. The hotel is responsible for the administration of those regulations. All alcoholic beverages must be served by a hotel representative. Menu changes received within 7 days prior to a function will be subject to additional charges. It is our intent to accommodate any requests due to dietary restrictions. These requests must be provided 7 business days prior to the function or an additional fee will apply. Should inclement weather occur, a decision will be made by Patron and the Event Manager regarding the reassignment of the function to an inside location. The Hotel reserves the right to make a final decision to move any outdoor function due to weather. The decision to move a function must be made no less than 5 hours in advance of the scheduled start time, depending on the complexity of the set-up. There is a 10:00 pm curfew for all outdoor functions. Please note that there is a minimum charge of 5 USD per box plus 4.712% tax from point to point for delivery and storage of meeting and event boxes. Boxes will not be accepted more than 7 days prior to the scheduled meeting or event. The Hotel can arrange entertainment and décor requirements. If you choose to book your entertainment direct, set-up/rental fees will be assessed for load-in, staging, lighting and power. It is understood that the premises will be left in a neat and orderly condition, free of debris or display refuse. Based on time and labor, the patron will incur additional charges for the removal of the group's material by the hotel staff at the close of any event. Decorations, signage and displays brought into the hotel must be pre-approved. Items may not be attached to any stationary wall, air wall, pillar, floor, door, window or ceiling with tape, nails or other substance in order to prevent damage. No signage of any kind is permitted in the lobby. Signage is to be utilized outside the meeting rooms.